No we’re not being sexist or patronising, the big news is that Beefeater, London’s very own gin, has announced Evelyn Chick from Harbor Room bar in Toronto, Canada is the winner of the 2015 Beefeater MIXLDN Cocktail Competition. In fact half of the countries in the global finals last week were represented by women. Great news for those who consider that the cocktail world is male dominated. Evelyn battled fierce competition from 31 national finalists in what was Beefeater MIXLDN’s biggest global final to date. 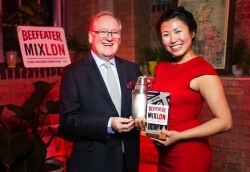 Her winning cocktail – the Endless English Summers – wowed judges, industry experts and the bustling MIXLDN crowd alike. The serve was inspired by the moment of peace and tranquillity that comes from stepping out of rush hour in the tube into a beautiful Royal Park after a fresh English rainfall. Judges included Beefeater Master Distiller Desmond Payne, award-winning industry experts such as Ryan Chetiyawardana, Anistatia Miller and Esther Media Cuesta and popular cocktail writers and critics BarChick and The Cocktail Lovers. Evelyn’s victory earns her the role of Beefeater’s Apprentice Brand Ambassador, giving her the opportunity to support the brand’s team of Global Ambassadors for one year. As part of this, following in-depth one-to-one training at Beefeater: The Home of Gin in London, Evelyn will represent Beefeater at exclusive events all around the world. As the reigning champion she will also travel to some of the world’s most prestigious bartender events, such as the Moscow Bar Show and the Berlin Bar Convent. Women triumphed at this year’s Global Final with Kelly Ballett from France winning the MIXLDN 2015 Bottled Cocktail Challenge, in which contestants were challenged to follow legendary London bar White Lyan’s signature move of serving exquisite cocktails from pre-bottled batches. Evelyn Chick also received a second award at The Signature Cocktail Presentation Challenge with her Endless English Summers cocktail. Pre chill stirring glass. Combine Beefeater London Dry gin, Fino sherry, ‘Green Park Cordial’ and salted Pernod in the glass. Add ice and stir to dilute (about 20 – 30 stirs). Strain into a chilled Nick & Nora glass. Garnish with a pomelo peel, cut and placed on the rim of the glass. Enjoy!